January is gone. Yay for lot of people. I remember when I used to work in an office how people did not like January. There were constant complaints about lack of money after Christmas, lot of moaning, evenings in and beans on toast for lunch. People were saving money, eating healthy and almost stopped having fun. And social media isn’t much different however people on social media do not show the real face so it is more about being vegan for a month and dry January. And although February still means cold weather and for some people it is still that “boring” period of the year I want to cheer you up and motivate you and show you how can you bring more fun and glam to your winter days. Throw a party – It can even be pyjama party however try to make it special. Invite your friends, bring lovely eye masks and start the evening with bubbles, good movie and nice canapés. The whole point of this to make it more glamorous and it is all about the small touches. If you can go big, throw a property party with nice food and cocktail dresses. Just keep a touch of glam whether it is nice wine glasses, good quality wine or lovely presented food. Buy something nice – Treat yourself. If you do not have big budget you can buy a nice lipstick. I am now so much into the new range of Dior Lip glow. It is for everybody as it is more tinted lip balm. I have been using the original for many years so it is such a treat to have option of new colours. Or it can be a nice treat like a cashmere scarf something that will give you a sense of luxury. Experiment with makeup – When we look good, we feel good or at least that is in my case. All of a sudden I feel more confident and I feel more glamorous. So why not to change something in your every day makeup. Who says that you cannot do more dramatic eyes on dress down Friday in the office? Put on that new lipstick or just look glam even when you have a weekday cinema date. Make your own cocktails – Even if you want to make your evening with favourite series more special this is worth it. Imagine sipping tasty cocktail from lovely decorated glass from your sofa watching Netflix. Touch of luxury and happy taste buds will make the difference. Do a cool workout class followed by a healthy brunch – Every time I go on social media or open my favourite magazine I find a new way how to work out. It is a fabulous way how to change your routine. And how about to go with your girlfriends and find the hottest spot in town for a brunch afterwards. Be part of Fashion Week season – I am not saying you have to sit front row but make fashion week part of your life. There are options how to stream the shows live and you can get the feel for new collections. You can even do it with your friends and organise a lovely afternoon in your flat and discuss the collection afterwards. Add one glamorous piece to your look every day – I love earrings and also my Chanel brooch. These things can add so much glam to your ordinary jumper. It is about making things more special, luxurious and feel good. Dine in style – If your budget does not let you to try a new restaurant or a luxurious brasserie you can dine in style at home. Find a new recipe and remember it is all about presentation. Even a simple roast chicken will look more high end if you serve it differently. I wish you all successful and happy February and try to bring as much glam and luxury as possible. And remember luxury can be just to have time for yourself. Leden je za nama a diky za to. Pro spousty lidi je to jeden z nejdepresivnejsich mesicu v roce. Velmi dobre si pamatuji, kdyz jsem jeste pracovala v kancelarskem kolektivu, jak lide nemeli radi leden. Porad si stezovali, ze musi setrit (to vite po Vanocich), jedli skrome, nechteli pit, ci drzeli dietu. A leden se pro vsechny vzdy tahnul. A tak nejak se vzdy vsichni tesili, az tento mesic skonci. A tak tu mame unor. Dalsi zimni mesic, ktery se muze nest v nudnejsim duchu. Uz se mozna nestmiva az tak pozde, ale jeste je zima, ponuro a lide se tesi na jaro. A tak me napadlo sepsat clanek s tipy, jak si tento mesic zprijemnit. Nejsem zastance extremu a proto ani uplne nesouhlasim, ze lide po obzerstvi pak proste propadnou an mesic veganstvi, jenom protoze je leden. Ocista je vzdy dobra, ale nemusi byt zrovna leden, aby jste se k ni odhodlali. A jak si teda ja budu zprijemnovat dalsi mesic? Usporadejte vecirek – a muze to byt pyzamovy vecirek s kamaradkama, ale udelejte si ho lepsi. Kupte si treba sampanske ci prosecco, prineste si krasne ocni masky, udelejte si nehty u hezkeho filmu a udelejte si dobre jidlo, ktere taky hezky vypada. A pokud je vas rozpocet vetsi, klidne usporadejte poradnou party, kde urcite dress code – coktail party. A proc ne? Je sice unor, ale jde o to udelat neco takoveho prave v unoru. Kupte si neco pekneho – Ja jsem se zamilovala do nove kolekce Dior Lip Glow. Originalni lip glow pouzivam jiz nekolik let a prijde mi skvele, ze si muzu poridit nove barvy. Muze to byt ale treba nova kasmirova sala, zkratka neco co vam doda pocit luxusu. Experimentujte s makeupem – Nemusite si na sebe nalepit flitrove rasy, ale staci mala zmena. Co treba v patek do prace udelat vyraznejsi oci, ci si dat sytejsi rtenku. Staci mozna zmenit jednu vec. Ja kdyz mam hezky makeup, tak se citim uplne jinak. Namichejte si koktejl – Jak si udelat normalni vecer doma u televize trosku jiny? Co tak si namichat nejaky dobry koktejl, sklenicku si nazdobite a prece jenom vecer u oblibeneho serialu nabyde trosku vice luxusu. Je to tak jednoduche. Zkuste nove trendy cviceni a pak si zajdete na zdravy brunch – Pokazde, kdyz otevru Instagram ci oblibeny casopis, najdu nejake nove trendy cviceni. A myslim, ze je to prijemny zpusob jak trosku zmenit rutinu. A muzete si na hodinu zajit s kamaradkama a po te si rezervovat brunch v krasne restauraci ci kavarne. Udelejte si proste radost tim, ze vyzkousite veci a mista, ktera jsou “IN”. Zucastnete se tydnu mody – A nemyslim tim, ze musite zjistovat jak se to dela. Muzete proste k vam pozvat kamaradky a podivat se na par prehlidek v primem prenosu. A po skonceni, muzet probrat, co se vam libilo. A samozrejme to muze byt u dobre kavy ci vina. To zalezi na vas. Jde o pocit, udelat neco jineho a prinest trosku mody do vaseho zivota. Pridejte nejaky glam ci luxusni kousek k vasemu outfitu – Ja rada nosim svoji Chanel broz, ale opet to nemusi byt zavratne drahy kousek. Co treba bizuterie z retezce, ktera pusobi luxusne ci jinak uvazany satek. Jde o to neco zmenit a citit se dobre. Jezte stylove – Ten kdo me sleduje delsi dobu, vi ze casto pisu i o dobrych restauracich. Rada zkousim novinky, restaurace, ktere jsou vyhlasene. Ale kdyz vam dam tip, at jite stylove neznamena, ze tim myslim jit do restaurace a utratit tam penize, ktere treba potrebujete na neco jineho. Ale muzete si napriklad vyhledat dobry recept a hlavne i kdyz veceri varite doma ji hezky presentovat. Hezka presentace a jak je jidlo naservirovane totiz udela hodne. A tak vsem preju prijemny mesic unor a hlavne si ho uzijte. A hlavne si pamatujte, ze luxus muze spocivat i v tom, ze si udelate vice casu sama pro sebe. It has only been two days since I have left this paradise and already want to go back. Who can blame me? 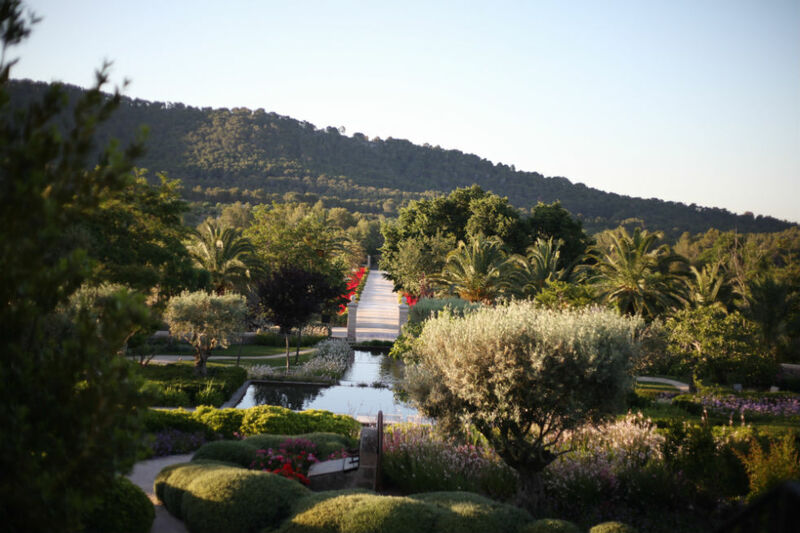 Let me take you on a little journey to Mallorca and feel the beauty of this stunning place Castell son Claret. Although I was meant to go with my plus one and baby Liam we had a big hurdle when boarding the plane and my friend could not leave UK due to some visa issues. I was terrified to travel on my own with 9 months old but I decided to go and really do not regret. The hotel staff made sure I had help at the airport and from that point they made my stay even better than expected. I kept saying to baby Liam we are a bit like a royalty, aren’t we? LOL. This place really is a hidden gem and luxury at Mallorca. Je to jenom druhy den, co jsem zpatky v Londyne z tohoto raje a uz bych se nejradeji vratila. A nemuzete me obvinovat, protoze tento prekrasny hotel na Mallorce Castell son Claret je skutecny raj na zemi.